Have you seen this? You can find out your Ravelry number. I knew mine would be low and I was right – #31. #7583 Interesting how the number doesn’t stick after you log out. 43, so you beat me. Weren’t we all beta testers for Jess at the dawn of Ravelry time? I remember waiting for my invite to join and being so excited when I got it. Ravelry has totally changed what I knit and opened up so many opportunities and possibilities. Plus I’ve met so many wonderful people who have truly become friends that I never would have met otherwise. Very cool! Thanks from #1711. It took a couple tries but I found out…# 38581. Fun!! Wow, Carole! How did you find out about ravelry? My number, BTW, is 11,533. I can’t believe it’s been 7 years. Hello from #136. Many of us joined without knowing what Rav really was, or what it had to offer. Pretty cool it’s on of the most amazing data bases ever built. Wow, you are early. 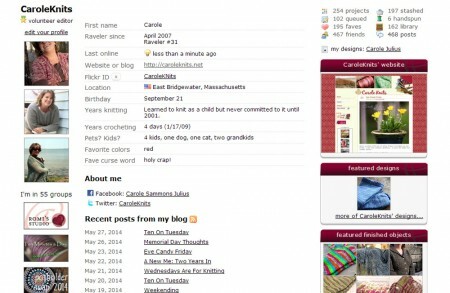 Were you really into knitting blogs back then? That’s how I heard of Ravelry…. All my profile says is I’ve been a Ravelry November 7, 2007. I don’t have a number, though. Is there something special I have to do to make the number show up? Wow – you really do have a low number! I’m #4884. I remember waiting for what seemed like an eternity to get my invite! It’s amazing how much Ravelry has become part of our knitting life. I tried the directions on my Mac laptop, and nothing happened…..
Couldn’t find my number – but been a member since 2008. Wow, that was fun. I’m 2109. I remember being on the beta waiting list. Fun. I joined only a couple of months after you . . . and I’m #11638! I remember waiting at least a week (maybe two!) for my invitation. It was all such an adventure! Being as techno-challenged as I am, I couldn’t get it to work, either. However, I have been a Rav member since November 3, 2007. I really wasn’t too excited about Ravelry in the beginning, but I use it daily now. Especially since I work in my LYS. Number 14669 here. I remember waiting for an invitation and then being out of town for three weeks and having limited dial up and missing my window of opportunity somehow and having to get another invitation. I am so glad that I did and can’t believe that it’s been seven years!